One of the greatest things that come out of a Music Festivals are the sideshows. 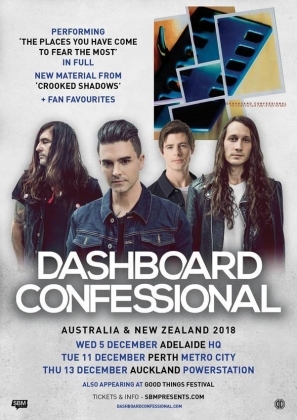 American rockers Dashboard Confessional have announced two headline shows to compliment their upcoming appearances at Good Things Festival in December. The band will play their 2001 album The Places You Have Come To Fear The Most in full as well as fan favourites and cuts from their latest album Crooked Shadows at Good Things Festival. They will be doing the very same thing at their headline dates in Adelaide and Perth.